The Vanuatu Prime Minister has ordered a compulsory evacuation of the entire population of Ambae due to the volcanic threat. Approximately 11,100 people, according to the 2016 mini-census are expected to leave on the advice of the Vanuatu Meteorological and Geo-hazards Dept, who are reporting increasing activity of the Manaro Voui volcano including flying lava, poisonous volcanic gas, acid rain and ash falls. Evacuation Centers have been briefed and and residents of Ambae are preparing to evacuate Ambae. They will be evacuated to Santo, Malekula, Maewo, and Pentecost. Prime Minister Charlot Salwai announced the compulsory evacuation of the entire island, with the aim to have it completed by Friday next week. 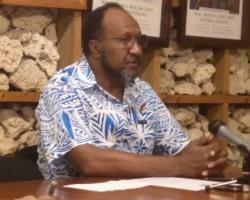 Salwai said travel restrictions would be imposed but for now Air Vanuatu said flights to the island were continuing. Media director of the Vanuatu Daily Post Dan McGarry said most people will be relocated to two publicly owned stretches of land on the neighbouring island of Pentecost. McGarry said the Prime Minister had taken the precaution in order to potentially save lives given the volcano's unpredictability. The alert level for the Ambae Monaro volcano was raised to four last Saturday, the second highest level in Vanuatu’s alert system, indicating a “moderate” eruption - and Vanuatu's Meteorology and Geohazards Department warned of flying rocks, volcanic gas, acid rain and ash falls. The MP for Ambae Jacob Mata said he was really concerned about people's lives. Mata said many people had already left the island but those who did not want to leave may have no choice. He said there were about 8000 people still on Ambae and most were in shelters near the sea shore preparing in case of evacuation. Mata said the island's volcano had a history of large eruptions with one in the 1860s causing a lot of damage. Meanwhile, New Zealand has responded to a request for assistance from Vanuatu and is working with the Adventist Development Relief Agency (ADRA) and the National Disaster Management Office to deliver Vt3.5 million(US$325,000) worth of water, sanitation and hygiene kits to those affected by the eruptions on Ambae. A New Zealand Defence Force P-3K2 Orion aircraft conducted an aerial survey of Manaro Voui Volcano on Ambae, as well as the volcanoes on Ambrym and Lopevi. The high-resolution surveillance imagery taken by the aircraft has been provided to Vanuatu’s National Disaster Management Office and the Vanuatu Geohazards Department to assist with their assessments of the volcanic activity. New Zealand has also funded GNS Science to deploy two volcanologists to further support the Vanuatu Geohazards Department with their assessments. New Zealand will also provide up to Vt4 million (US$371,000) of emergency funding, to assist Vanuatu with their immediate response to the state of emergency, and stands by to support the Government to respond to this developing situation.